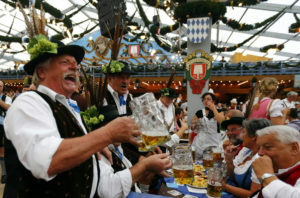 A fall tradition continues at Camp Richardson in Lake Tahoe, which will host the 24th annual Oktoberfest on Oct. 6-7. The Camp Richardson Historic Resort and Marina’s Oktoberfest will include more of everything – more food choices, beverages, and kids’ activities. The two-day festival runs 10 a.m. to 5 p.m. daily. Entrance and parking for the event are free. All festival tickets for food and beverage booths, pumpkin patch and kids’ inflatable activities must be purchased with cash at the ticket booths – www.camprichardson.com/oktoberfest. The Camp Richardson beer garden will be fully stocked with Oktoberfest and fall-inspired brews, includes two local brews from 50/50 Brewing Company and Alibi. Camp Richardson’s beer garden will be fully stocked with Oktoberfest and fall-inspired brews, including two local brews from 50/50 Brewing Company and Alibi. Festival goers can choose from German Spaten, Sam Adams Octoberfest, Deschutes Hopzeit, St Archer German Ale, Ninkasi Oktoberfest, Drakes Hefeweizen, 50/50 Oktoberfest and Alibi Pilsner. The festival will also offer Crispin Cider and a choice of three wines for purchase. Camp Richardson’s ode to the Munich festival is well known for its range of family-friendly activities from face painting and balloon art to bounce houses. This year there will be new inflatable games, including a basketball and football game for the children. The “Gruber Family Band” will play live polka music both days and will be accompanied by Marcia Sarosik’s dancers from Lake Tahoe Shining Stars on Sunday. For information on recreation, equipment rentals, lodging and packages visit www.CampRichardson.com or call 800 544-1801.